A project that aimed to provide data visualization deliverables to Dr. John Leonard and the Georgia Tech College of Engineering Dean’s Office based on the research of academic trends and goals that align with the growth of Georgia Tech. From August 2015 to May 2016, research and design work was performed for the Department of Institutional Research (IR) in the Georgia Tech College of Engineering. Data visualizations were created from publicly available data to highlight the goals, capabilities and accomplishments of Georgia Tech. This work culminated in design prototypes of dashboards for both the IR department and Institute regarding research funding and undergraduate enrollment trends in regards to gender and race. Examining enrollment trends at Tech helped clarify important aspects of Tech’s processes and helped highlight issues that could be addresses. Moving ahead, a strong framework has been established for the ways in which the Georgia Tech College of Engineering can collaborate with the College of Design. 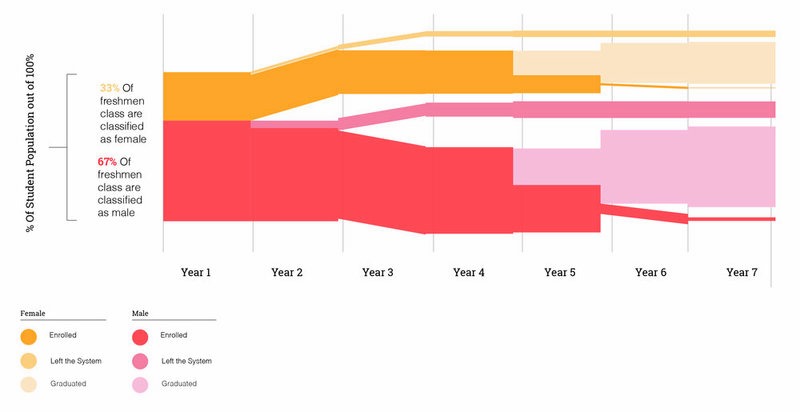 The above figure represents a holistic view of student flow over time. Beginning with enrolled students in the fall of 2007, there is a gradual increase in the number of students who have left the GT system not by graduating and an increase in the number of graduated students starting in the fall of year 5. Note: Data for graduated students only begins at spring of year 4. The above figure represent the percent change in the classification of 2007 freshmen cohort as compared to the previous year. A peak within the data set represents a relative change in number students. For example, the double spike for students that have left the systems indicate two periods in which students exit the GT system. Note: Data for graduated students only begins at spring of year 4. The above figures represent the numeric distribution of students over time as well as the proportion of student distribution in a given year. Darker values denote a greater prevalence of change and flux in a given year. For example, we see that the greatest amount of change happens in year 5. Note: Data for graduated students only begins at spring of year 4. 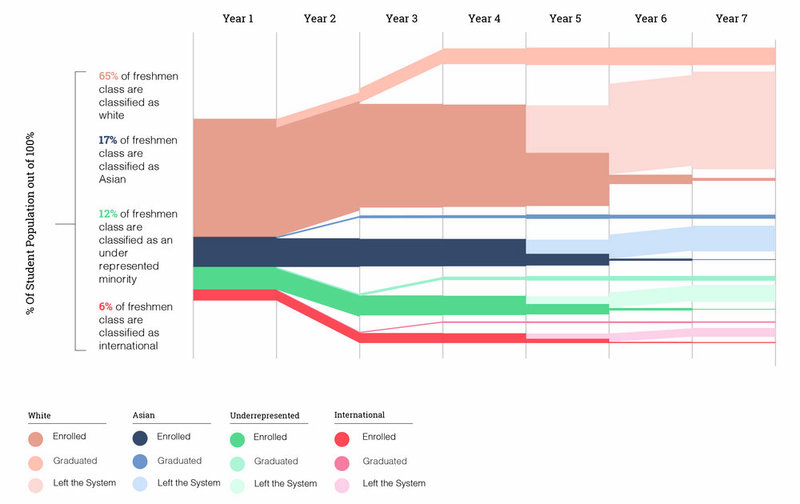 The above figure represents a holistic view of student flow over time. Beginning with enrolled students in the fall of 2007, there is a gradual increase in the number of students who have left the GT system not by graduating (shown at the bottom), and an increase in the number of graduated students starting in the fall of year 5. Note: Data for graduated students only begins at spring of year 4. The above figure represents a relative increase or decrease in the number of students classified as either enrolled, left, or graduated as compared to the previous year. Each classification is proportional to itself, but the 3 classifications are not proportional to each other. Note: Data for graduated students only begins at spring of year 4. In addition to the above graphs and charts, data was consolidated into a series of one page dashboards and info graphics. in addition to enrollment trends, topic covered items such as research funding, space usage, and hiring practices. The goal of this was to examine how monthly reports could be generated in regards to pertinanct college data, and then shared with college and department leaders.